The efficiency of many retail, delivery, and warehousing operations is dependent on having the right equipment to move products. Whether you’re moving fruit in a grocery store or a pallet of industrial chemicals, a hand pallet truck (HPT) can be useful for short runs where associates need a high level of maneuverability. But after you make the decision to purchase an HPT for your material handling needs, options for the right configuration might surprise you. Selecting the right HPT is just as important as the initial decision to acquire one from the Toyotaforklift.com Store. One of the most important features to consider is the wheel type. I know; you just want them to roll, right? But when you take a deeper look at your operation, you’ll see that selecting the right type of wheel can have a major impact. 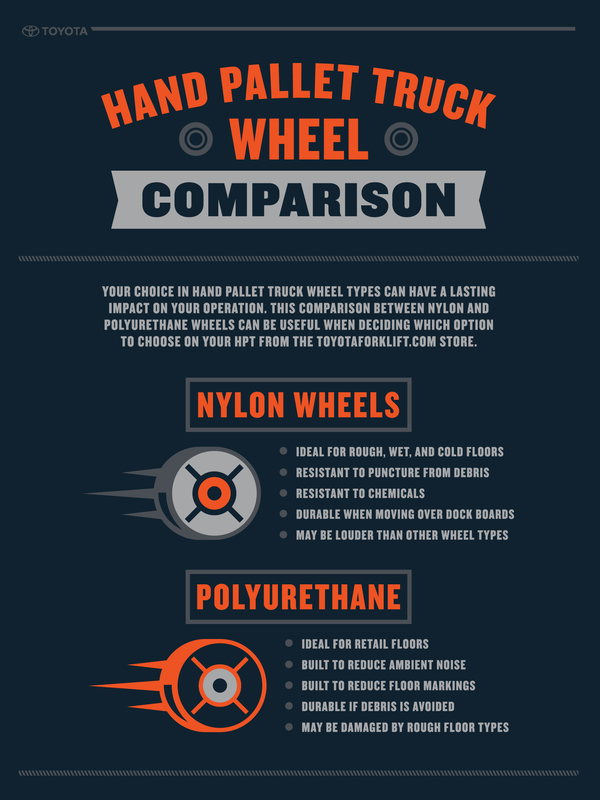 Two of the most common types of HPT wheels are nylon and polyurethane. But what difference does your decision between them make? As it turns out, a fairly important one. Retail stores are so much more than places to buy things for the house. In a world of online retailers and major competitors, setting your store apart is often about creating an excellent experience for your customers. And that means considering what might seem to be even the smallest detail. Enter the polyurethane option on the Toyota HPT. First, when used properly, these tires are quieter than nylon, meaning you won’t interrupt the environment of your store with excessive noise. And Polyurethane wheels are also non-marking and won’t scratch your floors as long as they are in good working condition. That way customers aren’t turned off by unsightly floor marks. The overall value of polyurethane wheels is their minimal impact on the customer-facing work environment. They are durable in these spaces and can lead to lasting success. However, if your needs call for longer runs on wet or rough surfaces, over dock ramps, and on outside loading docks, polyurethane wheels may break down too quickly to be practical. The daily wear and tear of delivery operations calls for a pallet jack configuration that can hold up for long periods on rough floors and changing environments. Moving from a semi-trailer, over a dock board, and onto bumpy warehouse floor that eventually opens into a freezer can cause serious damage to your material handling equipment if it’s not prepared to handle harsh conditions. The nylon wheels available from Toyota are engineered to handle these environments even at a high use rates. And if any of these floor types contain debris, as so often happens in fast paced operations, nylon wheels are equipped to handle it, resisting penetration because of their composition. The overall value of nylon wheels is their ability to hold up over time on wet, cold, rough and debris-ridden floors. However, they are not manufactured to reduce noise and they may be more likely to mark floors than polyurethane wheels. So what happens when you have a working environment that has needs that fit the profile for both nylon and polyurethane wheels? The simple answer is to acquire more than one HPT and assign them to designated areas and for designated jobs. But I understand that isn’t always an option. If that’s the case, take time to carefully evaluate your HPT use and needs to make an informed decision. Will your clientele be bothered by a little extra noise on the retail floor? How dedicated can you be to keeping a backroom/distribution area free of debris? How often do you receive shipments that will require your HPT to go into rough-surface areas and are you willing to replace wheels more often if you decide to go with polyurethane? When deciding what HPT wheel to purchase for a multiple use operation, remember to do a thorough analysis of your needs and weigh the relative value of each. Receive $2,000 on Select Trades. Offer Details:1.Valid Through April 30th 2018.2.$2,000 factory rebate on trade in of an operational competitive branded forklift. *3.The Trade Up to Toyota Factory Rebate is applicable on Electric & Internal Combustion counter-balanced models only.Additional information can be found at this LINK. *Certain conditions apply. Trade in must be operational. Rebate does not apply when trading in a Toyota product.